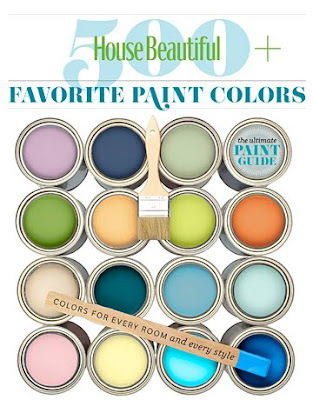 " 500 Favorite Paint Colors". It has been a really intriguing read...seriously. If you love design...and color...or even if your a beige and white fan, you'll really enjoy this! It is essentially a collection of favorite paint colors from real designers...not just paint manufacturers. And the photographs are gorgeous. 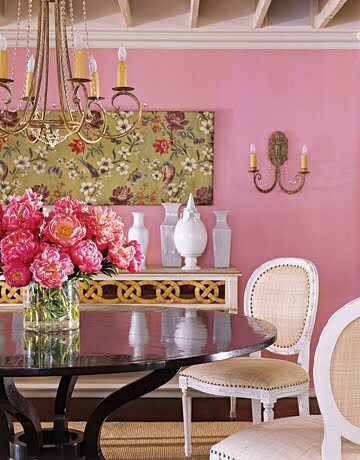 I sure wish I could get away with a pink room in my house..aren't these just amazing? And black....there's seems to be an increase in the use of black walls in decorating...they don't have to be scary. Black is amazingly sophisticated, and not necessarily dark or dreary. Check out this living room...dare I use the word "bright" with the color black? In this room, the answer could just be "yes". 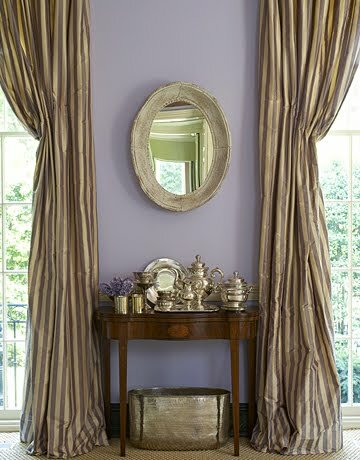 I had a periwinkle purple room when I was 8 years old...I must admit, I've never thought of it as being sophisticated, but in the room above? Absolutely lovely and sophisticated. There is even a section about colorful neutrals. I found this section to be very intriguing. In the photo above, the lavendar is used as a neutral. And I think it totally works. In the words of Jeffrey Bilhuber, "Lavendar is the new beige. From lilac to amethyst, it's an extraordinary neutral and great unifier - a soothing, peaceful color that is timeless." Other colors they suggest using as neutrals...pale pink, blue-gray, even peach. Gives neutral a whole new spin, huh? I just might never look at color the same way again. And remember back in April when the Princess and I participated in Justin Hackworth's 30 Strangers project? If you're a Utah local, Justin is having his 30 Strangers Project show this weekend in Provo. We'll be there checking out his amazing photography. You can get more information here. That purple room makes me want to go buy that gallon of oops purple I keep seeing at Home Depot that is so pretty that I just wouldn't know what to do with. It's such a pretty color! I bought the issue a few weeks ago...worth every penny. I already used the lime color and peony in my girls' playhouse. They are perfect, and I know I would have been heading to the store over and over for the perfect match! The colors are so beautiful although I'm not too sure about the black. 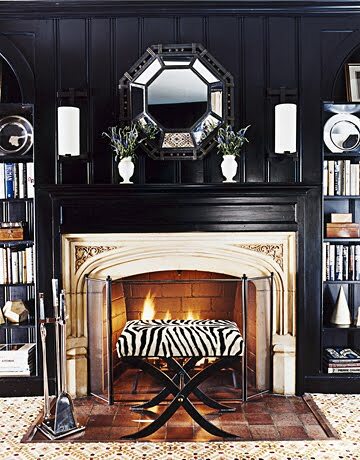 I have yet to hear a client say “I would love a black room in my house” for me, it's a tough color to sell but would be beautiful in the right application. The purples and blues are going strong here in Charlotte and I've used them time and time again. There're classic beauties! Oh that makes the snowball white I just picked up look so boring!! I need to pick this up as I brainstorm my next project! As a stager and faux painter, may I add one word of warning that I learned the hard way? I bought this issue and had several quearts (thank God, only quarts!) made up with some of the colors I really liked. 5 quarts to be exact. I was mortified when the paint shop (a Benjamin Moore dealer)opened the lid and showed me the paint. It looked nothing like it did in the magazine! He explained that the magazine print and lighting on the set changes the colors. I should have went over to the samples and pulled the sample sheet from the rack to see the true color. Please be smarter than me and look at the paint chip in the store first. They look nothing likethe magazine. I don't owe enough rooms to use all the colors I am in love with!!!! And then my clients just want to copy me...go figure. Time to sell? Just kidding!! Wow! This is so cool! We are hoping to buy our first home in the next year, so this would be a fabulous resource to have. Can't wit to check it out...thanks! Beautiful photos!! I really love the black! I am soooo loving the pink. 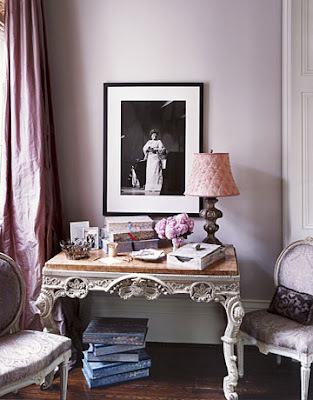 Wish I could get away with a pink room too!! I got the House Beautiful paint edition last year, and NOW I'll have to head out and buy this year's! I let my subscription run out despite the URGENT WARNINGS! Ha! I have a pink room, and I love it! !